I always loved family gatherings when I was little- too many people talking too loudly, too much good food everywhere you looked, too many cooks in the kitchen, too many people running every which way- it was glorious! But one of my absolute favorite things was the tales my great-uncle would tell of what, at the time, seemed like far off lands, travels and his life abroad. Those stories took a hold in my heart somewhere and never quite let go. They were the catalyst that would one day be sparked to life by the family road trips of my youth and consequently ignite into a full fledged burning desire to see every corner of the world. Despite all this, there was a time, in the not so distant past, where frequent traveling, especially abroad, just wasn't an option. Since traveling is important for both Mr. RC and I, we worked hard and planned diligently to incorporate it into our lives. For us, that means, we spend less on material things and going out to eat and foregoing birthday and Christmas gifts for each other in favor of taking trips. For some, however, travel just isn't an option, no matter which way you work it or what you sacrifice. Kids, mortgages, work, car repairs...they can get in the way for any of us. Read a Foreign Book || Nothing makes me escape faster than the pages of a novel set in a different country. No surprise here, but I'm particularly fond of books having to do with Paris or France. Conquer a Favorite Foreign Recipe || Beef bourguignon anyone?! Or how about fish 'n chips? Better yet, why not find a foreign cooking class (a sushi one has been on my list to-do for a while) and make it a fun date or night out with friends?! Visit an Ethnic Neighborhood || Similarly to above, this one might be a bit easier in a bigger city, but consider making a day out of exploring certain areas, be it Little Italy or a Chinatown, of wherever you live. Check out the food, the culture, the stores, see if there are any special activities or events coming up, and treat the day as you would if you were truly in another country. Learn a Language || Because if you can't be somewhere, you can at least talk like you are, right?! 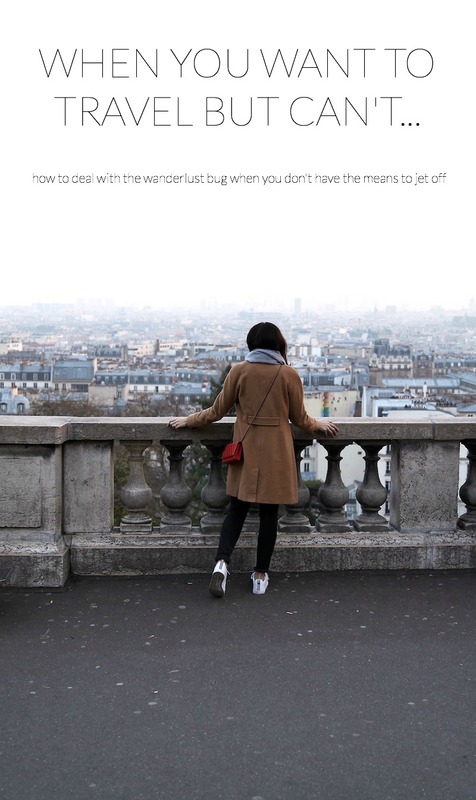 What do you do if you're having the itch to travel but you can't?